The CA-AAUP Executive Board directs that CA-AAUP committees shall observe the following guidelines except where a committee's charge explicitly directs otherwise. Committees shall generally have no fewer than three, and no more than seven, members. Terms shall be for three years and shall be renewable for a second term. A third term may be approved by the Board, in extraordinary cases. Every effort shall be made to ensure that committees are broadly representative of the Conference's diverse constituencies. Terms on committees shall be staggered. When a new committee is established, the initial terms of its members shall be staggered by mutual agreement of the new committee members or, failing that, by lottery. Appointments shall be made by the President upon the advice and recommendations of the Board. Except in extraordinary circumstances, all those appointed to serve on committees of the Association must be members in good standing of the CA-AAUP. This committee shall address issues of concern to contingent faculty. It will work to limit institutions’ abuse of, and over-reliance on, contingent faculty members while pressing for equitable treatment of all faculty in matters of workload, compensation, evaluation, and professional development. Every effort shall be made to ensure that at least one, and preferably two, members of the Steering Committee are serving on this committee at any given time. This committee shall monitor legislation of concern to faculty in California; analyze pending legislation and initiatives; and recommend appropriate policies, positions, and actions to the CA-AAUP's Board. The committee shall advocate positions at all levels of government that are beneficial to the higher education community, and shall keep the membership informed of their efforts. Members of the committee may be asked to testify at legislative and executive hearings on matters of concern to higher education. 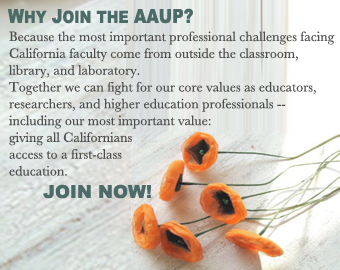 This committee shall coordinate with other bodies in the Association to ensure that the CA-AAUP effectively promotes its work and principles to California's higher education community. The committee should also strive to keep the general public informed of the contribution that California's faculty make to the common good. This committee shall have oversight of the CA-AAUP's mass communications (including, but not limited to, the CA-AAUP's website, newsletter, and advertisements). Generally, the CA-AAUP's Newsletter Editor shall chair this committee.